Hi everyone, Heidi here on the blog! Today I have this bright and sunny birthday card for you all. 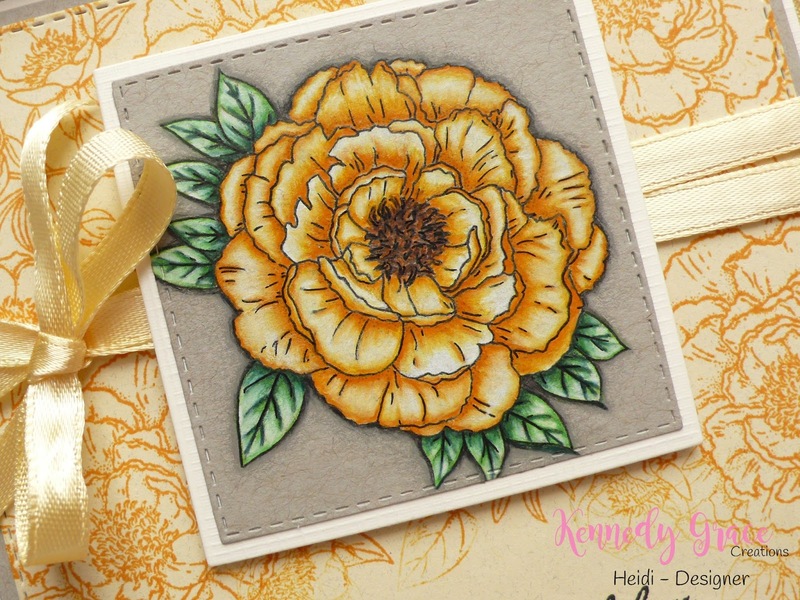 To get this card started I stamped the biggest flower from the gorgeous Kennedy Grace Creations stamp set “Beautiful Blooms - Sweet Rose” onto some Strathmore “Toned Gray” paper with Versafine “Onyx Black” ink. 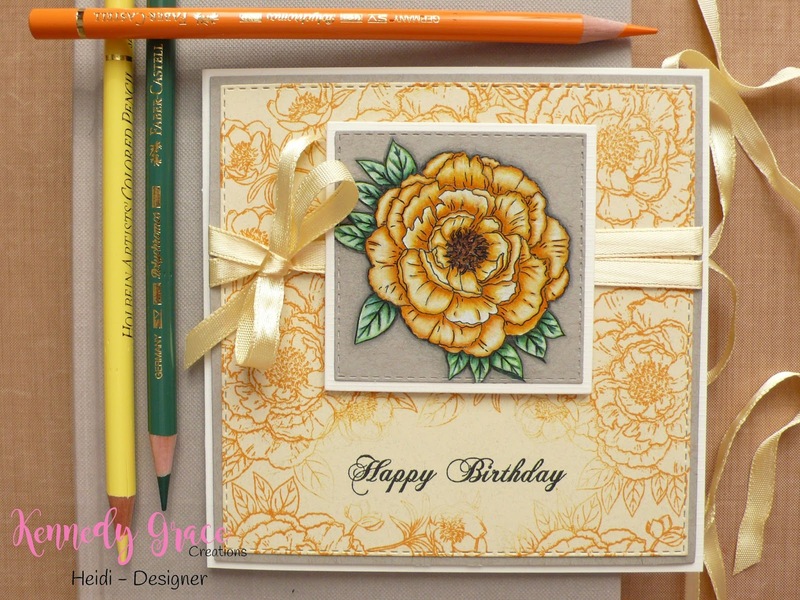 I made sure that I didn’t stamp the smallest flowers, just the big one, as a stand alone flower. This stamp set is very versatile, you can use the little flowers alone, the big flower alone and of course the combination (like it’s meant to be), you can colour the flowers, but you can also stamp them without colouring because the stamp is so wonderfully detailed! You can even create an entire background with the one stamp, like I also did on this card! Next I started colouring the image with my coloured pencils and I didn’t use many pencils: for the yellow part I only used three pencils: a Faber Castell Polychromos number 111 (Cadmium Orange), a Holbein Artists’ Colored Pencil number OP127 (Cream) and a Caran d’Ache Luminance pencil in 001 (White). Other colours that I used are: Faber Castell Polychromos in the colours 166/165/187/176/272 and 199. Each petal of the flower that I finished colouring I draw over the stamped lines again with my Copic Multiliner 0.3 (because you colour over the lines a little you loose the definition and I liked the image better with crisp lines, this is personal preference, you don’t have to do this of course). After the colouring is done I cut out the image with a stitched rectangle die in the size I wanted and I also die cut a square one size larger from some crème coloured linen textured card stock that I also used for my card base. Then I started working on my background: I die cut two square panels: one from the Toned Gray paper that I coloured my flower on and one from some light yellow card stock with a grey undertone (for this panel I used a stitched die). On the light yellow panel I stamped one of the sentiments that comes with the flowers in the same “Beautiful Blooms - Sweet Rose” stamp set with the same black ink as used before and then I started stamping the same flower image with the two smaller flowers with Distress Ink in the colour “Wild Honey” around the sentiment (wiping most of the ink of with my finger where I comes closest to the sentiment) and working my way up over the whole background panel. I used my MISTI stamping tool for this but you don’t have to. And then it’s time to put this card together: I glued the smaller set and the bigger set of die cut square mats together with liquid glue. I adhered some matching ribbon from my stash around the biggest squares, taping the loose ends to the back with regular tape, and I also created a bow from the same ribbon with a separate piece. Next I foam taped the biggest panels to the card base with one millimetre thick foam tape and finished this card by foam taping the smaller squares to the card with two millimetre thick foam tape. And that finishes today’s card! I wish you all a creative day! Such a beautiful card!! Beautiful coloring!! I love the background you have created.